We love to travel and we sure love a good freebie every now and then, so when Poorsquare combined these two things into a single package, it was already on its way to becoming a winner. 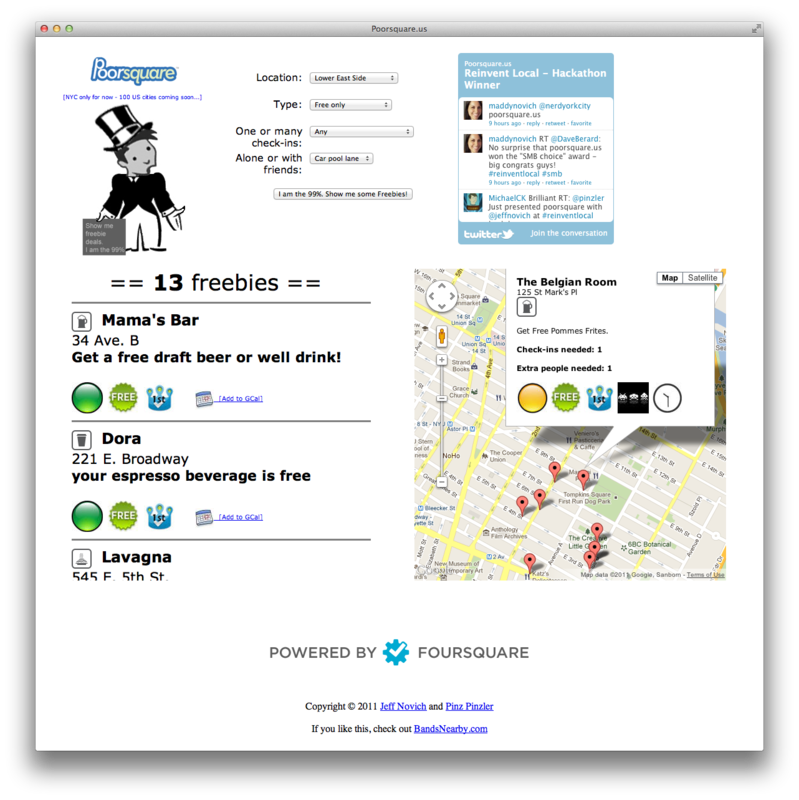 Founded by Columbia Journalism School alumnus Jeff Novich and Andrew “Pinz” Pinzler, who graduated from the Kellogg School of Management, Poorsquare is a simple Web app with a simple mission: to point you to the free stuff in your neighbourhood. It leverages Foursquare’s location, places and deals databases to achieve its purpose in life. Here’s how it works: you select the location you are interested in, the list of which currently online includes places in New York only, the type of free stuff you want, whether it should require a specific number of check-ins and if it applies for more than one person. You can, for instance, look for all the places in the Lower East Side in Manhattan that are offering free stuff for a single check-in for one person. Or you may choose to include stuff that is free with a purchase and may require more than one person groups for eligibility. The site ranks the quality of the deals for you, so you know beforehand if something is only “a decent freebie” or if you should “take advantage of this handout!” It also tells you if something is free with no strings attached and lets you add deals that are only available during certain times to your Google Calendar. We know, for instance, that Dora Coffee on 221 E. Broadway will give you a free espresso at any time of the day just for walking in and check in to Foursquare from the joint. A Google Map on the side of the page plots all the locations that have turned up in your searches, so you can find directions easily. It is a pretty interesting idea and has been executed nearly to perfection, and it must be beneficial for the brands offering these freebies as well. The easier it is for you to find the one bar that will give you a free beer for walking in, the more likely you are to do just that. And then you advertise the place on Foursquare and maybe even pay for the next round, so we guess everyone wins.